Henry Cort (?1741 – 23 May 1800) was an English ironmaster. During the Industrial Revolution in England, Cort began refining iron from pig iron to wrought iron (or bar iron) using innovative production systems. 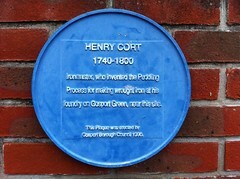 In 1783 he patented the puddling process for refining iron ore.
Henry Cort 1740 - 1800 Ironmaster, who invented the Puddling Process for making wrought iron at his foundry on Gosport Green, near this site.